There's a certain type of panic that sets in the moment you open your closet in the morning. As you risk being crushed by the coats, dresses, and sweaters practically jumping off the jam-packed hanger rod, you feel the anxiety of attempting to pull together an outfit that's some combination of comfortable and cool. 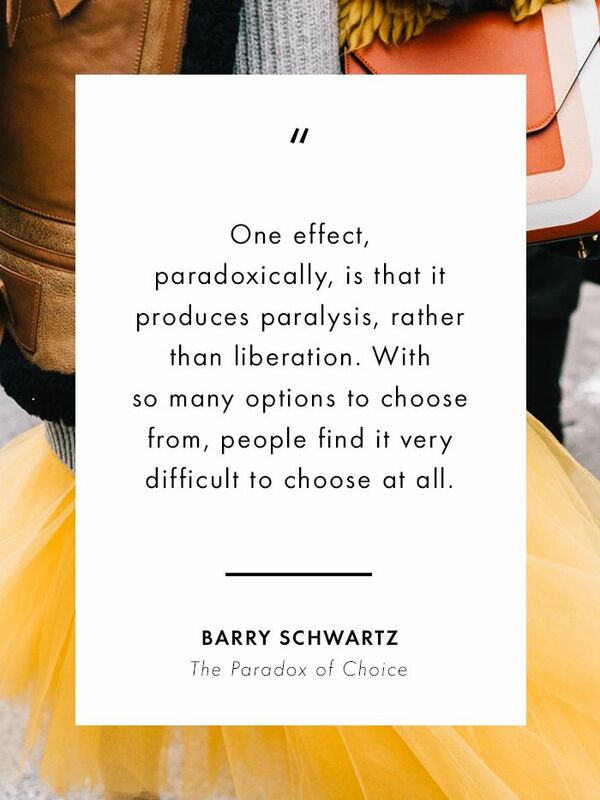 It's the paradox of choice, simply put, the idea that options are a good thing—until they aren't. When we're overwhelmed by choice, not only is it harder to make a decision, but we're also less happy once all the work is done. It's an idea discussed at length by psychologist Barry Schwartz, who cites his own experience trying to find the perfect pair of jeans as the impetus for his own research. There have long been those who tout a Marie Kondo style cleanout, others a commitment to a capsule wardrobe, but for those of us unwilling to completely strip down our wardrobes, is there a "happy" medium? That's what I set out to find. "The growing recognition is that we really need to go beyond those sort of group, 'here's what works for everybody' interpretations and take a more individually tailored approach," says Elizabeth Dunn, a psychology professor in the field of money, time, and happiness at UBC and a co-creator of Joy, an app that allows you to track happiness and spending. Dunn notes that while traditionally, studies have focused on a one-size-fits-all approach, in reality, everyone's exact number will be different. "It's not so much about the core closet size as the Core Closet Values," agrees Annmarie O'Connor, author of The Happy Closet. "As we evolve, so do our wants and needs, so does our relationship with clothing." While both O'Connor and Dunn eschew the idea of settling on an exact number, they both place value in qualitative analysis. "The most fundamental principle in happiness research is what's called hedonic adaptation," Dunn notes, an idea which boils down to a law of diminishing returns. Each new pair of jeans you buy brings you a little less happiness than the last. "When people hear that, they’re like, 'yeah of course.' But the challenge is when you're standing in line at the department store with this really nice pair of shoes in your hand, it can be hard for people to apply that principle." While shopping thoughtfully is a crucial component in creating a wardrobe that brings you happiness, but evaluating what you already own is key. When we're paralyzed by the idea of figuring out how to pair what we already own, there's a need to more actively evaluate when enough is enough. "The more limitations we put on choice, the less confusion, the less stress, and the more our creativity can flourish," notes O'Connor. "The paradox of sticking to a style signature is that although it appears abstemious, it is, in fact, incredibly freeing." This means that, for some, it will be easy to embrace a streamlined uniform, but for others, the internal conversation is more nuanced than might be thought originally. To create maximum happiness, there needs to be a certain amount of editing, the ability to evaluate what it is that's stressing you out, and eliminate it once and for all. To help start you on that journey, below you'll find a selection of items that are easy-to-repurpose basics, a solid start to a streamlined wardrobe. From there, you can easily figure out what may be missing and, well, what's just too much. A sleek moto jacket works for all seasons. When it comes to jeans, you want a few pairs that you can easily dress up or down. Workout gear is an important component in any wardrobe, so make sure you opt for comfort above all. A classic pair of black boots is a must—just make sure you can walk in them. This wrap dress is great for evening but can work for the office, too. Sneakers in a classic silhouette work just as well with skirts and dresses, making them an easy staple. Stick to jackets that will keep you warm but still look dressed up if needed. This unexpected top will get so many wears. A pair of black skinny jeans is an essential wardrobe component. Available in sizes 12W to 24W. Every woman needs a shoulder bag that fits all of her everyday needs. In addition to black boots, consider a colorful or white pair as an alternative. For days when a small bag just won't do, make sure your bag of choice can hold what you need but still looks structured. A midi dress that's great for brunch or the office. This trench will go with everything in your closet. A simple, well-fitted tee always has a spot in your outfit rotation. Pumps with a sweet twist. Bottom line: It's up to you to decide that magic number, but there's nothing wrong with keeping things simple.